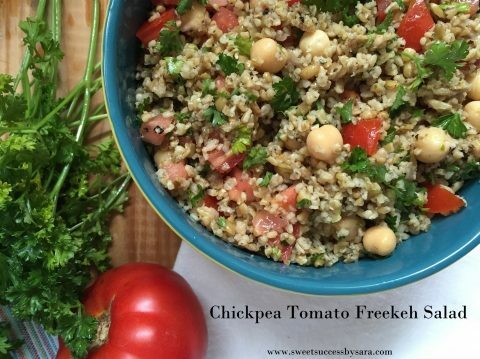 Chickpea Tomato Freekeh Salad + a Freekeh Foods Giveaway!! *Freekeh Foods provided me with two packages of freekeh to try as part of a campaign with Fit Approach. I’m a Sweat Pink Ambassador through Fit Approach. All opinions are my own! Lately, I’ve been in a pretty regular rotation of brown rice, quinoa, rice noodles and more brown rice for dinners. I always like to have a healthy grain witih dinner, but things have been getting a bit boring around here. So I was excited when Freekeh Foods offered to send me two packages of freekeh (pronounced “free-kuh”). It’s a grain I had never tried before! Freekeh has up to three times the fiber and protein found in brown rice and fewer calories than quinoa. You can use freekeh the same way you would use rice or quinoa. You can add it to soups and salads, create main dishes or add natural sweetener and fruit to make breakfast dishes. Check out some recipes here. You cook freekeh just like rice or quinoa. You use 1 part freekeh to 2.5 parts water or broth, bring to a boil, cover and reduce heat, and simmer for 20-25 minutes. I tried Freekeh Foods’ Original and Rosemary Sage freekeh. I paired the rosemary sage with lemon dill cod and roasted carrots with butter. This meal was so so good! I also paired the rosemary sage freekeh with a turkey burger and grilled vegetables. Also delicious! I made a delicious freekeh salad inspired by tabbouleh. I used leftover cold freekeh and tomatoes from my garden. It’s perfect for the end of summer when your garden is exploding with tomatoes! Freekeh will definitely be added to my rotation of grains!